Yours is the day, yours also the night; you have established the heavenly lights and the sun. You have fixed all the boundaries of the earth; you have made summer and winter. 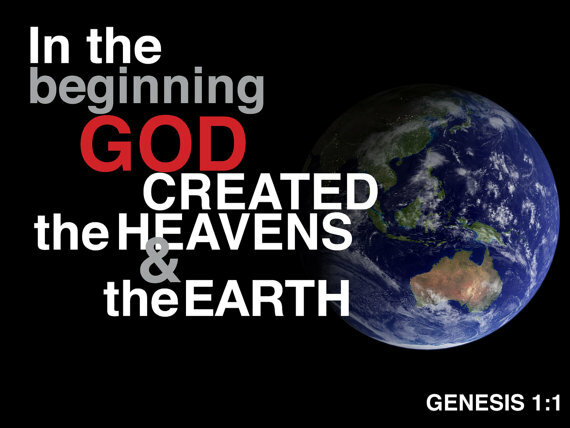 Henry Morris, Ph.D., wrote “One of the traditional “discrepancies” attributed by the skeptics to the Genesis account of creation is the fact that there was “light” (Hebrew or) on the first day of creation week, whereas God did not create the “lights” (Hebrew ma-or) to rule the day and the night until the fourth day. However, it is interesting that modern evolutionary cosmologists find no problem in having light before the sun. According to their speculative reconstruction of cosmic history, light energy was produced in the imaginary “Big Bang” 15 billion years ago, whereas the sun “evolved” only five billion years ago. Thus, even in their attempts to destroy the divine revelation of Genesis, they inadvertently find it necessary to return to its concepts. Light energy somehow had to be “prepared” before the sun and other stars could ever be set up to serve as future generators of light energy. The fact that light is an entity independent of the sun and other heavenly bodies is one of the remarkable scientific insights of the Bible. As the basic form of energy (even intrinsic in the very nature of matter, as expressed in the famous Einstein equation), it is significant that the first recorded word spoken by the Creator was: “Let there be light.”. In this chapter, the psalmist is entreating the Lord of light, the Creator of all things, to deliver His people from those who are seeking to destroy all genuine faith in the true God of heaven. Probably the most ridiculed passage of Scriptures by atheists, agnostics, evolutionists and secular scientists (among others) is the history of Creation of the Earth and the universe. The ridicule begins when one reads the text that states “Let there be Light” in Genesis 1:3, however the Sun and the Moon were created and may possibly even been relocated to their present position in our Solar System. James Clerk Maxwell (13 June 1831 – 5 November 1879) was a Scottish mathematical physicist. His most prominent achievement was formulating classical electromagnetic theory. This unites all previously unrelated observations, experiments, and equations of electricity, magnetism, and optics into a consistent theory. Maxwell’s equations demonstrate that electricity, magnetism and light are all manifestations of the same phenomenon, namely the electromagnetic field. Subsequently, all other classic laws or equations of these disciplines became simplified cases of Maxwell’s equations. Maxwell’s achievements concerning electromagnetism have been called the “second great unification in physics”, after the first one realized by Isaac Newton. Maxwell demonstrated that electric and magnetic fields travel through space in the form of waves and at the constant speed of light. In 1865, Maxwell published A Dynamical Theory of the Electromagnetic Field. It was with this that he first proposed that light was in fact undulations in the same medium that is the cause of electric and magnetic phenomena. His work in producing a unified model of electromagnetism is one of the greatest advances in physics. Heinrich Rudolf Hertz (22 February 1857 – 1 January 1894) was a German physicist who clarified and expanded James Clerk Maxwell‘s electromagnetic theory of light, which was first demonstrated by David Edward Hughes using non-rigorous trial and error procedures. Hertz is distinguished from Maxwell and Hughes because he was the first to conclusively prove the existence of electromagnetic waves by engineering instruments to transmit and receive radio pulses using experimental procedures that ruled out all other known wireless phenomena. The scientific unit of frequency — cycles per second — was named the “hertz” in his honor. The most dramatic prediction of Maxwell‘s theory of electromagnetism, published in 1865, was the existence of electromagnetic waves moving at the speed of light, and the conclusion that light itself was just such a wave. This challenged experimentalists to generate and detect electromagnetic radiation using some form of electrical apparatus. When considering “invisible” forms of light, it becomes quite clear that the phase ‘Let there be light’ in the text of Genesis 1:3 would indicate that light was created as the Holy Bible tells us in this passage of Scripture. Gamma rays, beta waves, ultraviolet waves, protons, neurons, and elctrons can all create nuclear fission and/or nuclear fussion. Science doesn’t need to change their “Big Bang Theory,” science needs to change the their theories of how the “Big Bang” came about – through a Creator, not statistically impossibilities.